^ Duggan, Anne J., ed. Nobles and Nobility in Medieval Europe: Concepts, Origins, Transformation. Rochester, N.Y.: Boydell & Brewer, 2000. p. 36. ^ Henderson, Ernest F., A History of Germany in the Middle Age. London: George Bell & Sons. 1894. p. 115. ^ Hammer, Carl I. 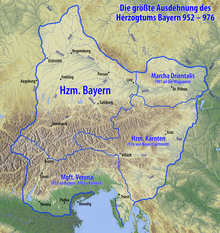 From Ducatus to Regnum: Ruling Bavaria under the Merovingians and Early Carolingians. Turnhout, Belgium: Brepols Publishers, 2007. p. 274. ^ Stubbs, William. Germany in the Early Middle Ages, 476-1250. ed by Arthur Hassall. New York: Howard Fertig, 1969. p. 81.